On Saturday 24th November we held our famous Christmas Tree Light Switch On Event at the Puss in Boots. Following last year’s success, we worked hard to make the event even bigger and better this year and it truly was a spectacular evening. Taking advantage of the good (but cold!) weather we were able to expand through to our car park, meaning the impressive trailer bar we borrowed from Robinsons Brewery was central in the festivities. As the mulled wine flowed, hunger was kept at bay with burgers and hot dogs from the BBQ. The little ones were kept entertained by a face painter, bouncy castle and of course visiting Santa in his grotto before he made his guest appearance to light the tree at 7pm. Kenny, alongside Stockport Silver Band, kept grownups and children alike entertained and, as always, they added perfectly to festive cheer. We would like to thank Santa for taking time out of his busy schedule to join us and light the Chritsmas tree. 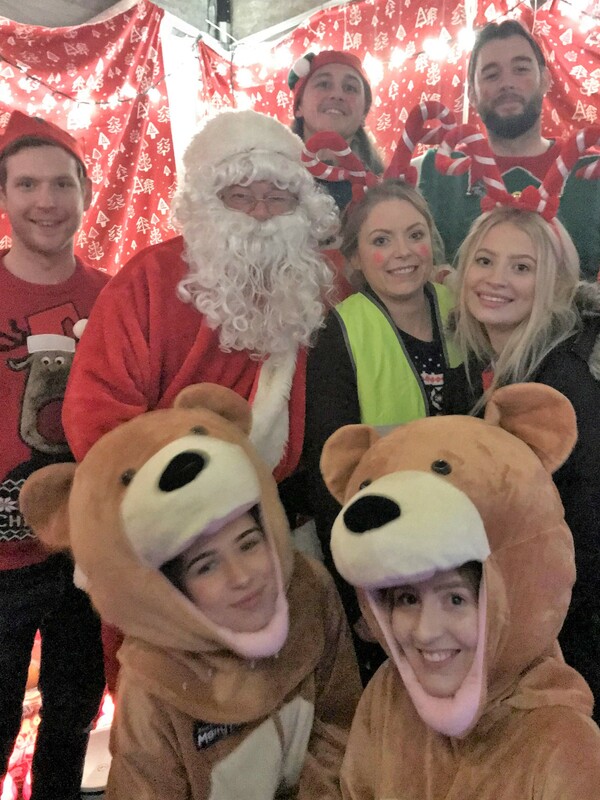 Thanks also goes to all of our team members who transformed in to helpful elves and worked so hard to make the event run as smoothly and safely as possible. As some of you know, our chosen charity is Foundation for Prader-Willi Research, the UK based charity who fund research into PWS. Vicki’s daughter Bella has PWS and Almond Family Pubs raise money through our events throughout the year. Thanks to your generosity, we raised nearly £1,000 for FPWR UK for which we are grateful. Thank you to everyone involved in making this happen. Whether it was through donating raffle prizes, knitting hats (thanks to Claire’s mum, Maureen!) or buying novelty items and raffle tickets from our charity stall.